While Japan's adventures were evolving away from text parsers to menus, adventures in the west were doing something quite similar. In the early 1980's, Sierra On-line began releasing adventures marketed towards children that were adventures with text narration and static graphics but didn't use a parser. The first of these was Dragon's Keep in 1982. It was marketed as a hi-res learning game, a children's game extension of their hi-res adventures line. Rather than having a text parser, there was a menu available which let the player choose which action to take next, in a choose your own adventure style. This engine would be used in Sierra's other children's adventures, including the first adventure games released under Sierra's contract with Disney, until 1984. 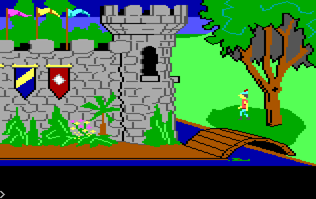 The western market began to evolve in it's own direction with the release of Sierra's King's Quest in 1984. This game used the Adventure Game Interpreter (AGI) engine, which shared some components with the Dragon's Keep engine, but had a parser and added a direct controlled protagonist. This addition meant that the game presentation was switched to a first person perspective to a third person perspective. Third person perspective adventures remain the most popular style of adventures today. George Lucas founded the Lucasfilm Computer Division in 1979. Computer games continued to grow in popularity, so in 1982 he began hiring people to join the games group within the computer division, which became Lucasfilm Games and then later LucasArts. Their first adventure game was Labyrinth, based on the film of the same name. It began completely in text, but then as you entered the labyrinth, the game switched to graphics. It had a direct controlled protaganist and it didn't have a text parser. Instead it had two menus, one with a list of verbs, and another with people and objects to interact with. 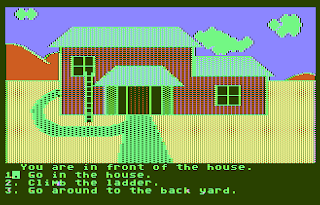 This verb object interface would later be refined in their later games created with the Script Utility for Maniac Mansion. These types of adventures went out of popularity by the end of the 1980's, but as with all forms of entertainment, there are still a small group of people who still make games in these styles. The menu based text adventure gameplay is used in some mobile ports of text adventure engines. There is also a group of fans that still make games using tools that have reverse engineered Sierra's AGI engine so that they can create games using that engine themselves.